The Tett Center for Creativity & Learning is proud to offer a meaningful and interactive artistic experience that fosters creativity, helps develop new skills, and inspires students to express themselves. During this dynamic multi-media arts program, students will have the opportunity to work alongside local artists and performers, enjoy a behind-the-scenes tour of the Tett Centre, and explore two unique creative disciplines each day. Participants can expect: a positive and encouraging environment, a day full of immersive and collaborative art-making, with access to a variety of materials and artistic resources! All materials included. Have you ever wondered how to create a series of multiple prints, or how to efficiently design and print custom t-shirts or cards? 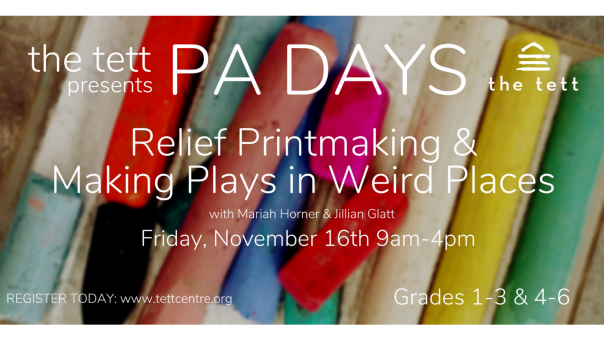 Join artist Jillian Glatt for a comprehensive introduction to relief printing! With endless possibilities, this hands-on workshop will encourage participants to explore their ingenuity through new ideas and creative processes. Learn the cultural history of relief printing, and discover the key techniques and tools used to carve and complete a custom design, re-usable hand-carved relief block, and small print edition. No printmaking experience necessary. Join site-specific theatre artist Mariah Horner and make a play in a weird place in the Tett! After a morning of theatre games to get you on your feet and out of your shell, students will write, direct, and star in their own short play in closets, corners, and hallways of the Tett Centre. Please complete payment via Eventbrite. There are 2 separate Eventbrite links for each PA DAY session. Please ensure to register your child in the appropriate age group. Groups are divided into Grades 1-3 and Grades 4-6. - Please prepare and pack an adequate lunch, snacks and water/juice for your child. - Participants should dress for mess. - Please bring suitable outdoor clothes.